My youngest daughter loves to draw and sketch. We noticed her artistic talents at an early age, when she would be able to look at a picture and draw what she saw freehand. Now that she is six years old, she is still drawing, but now adding some of her favorite hobbies and likes to her drawing, including fashion. While she is not a huge fashionista, she does like to pair some unique outfits that I wouldn't have the courage to leave the house in. But, when we are out and about, go figure, she is the one getting all the compliments on how great her outfit is, or how the shirt she is wearing really brings out her eyes or goes great with the unique patterned leggings she has one. When Bella hears this, she is all smiles, and can't wait to go back home and doodle and draw new designs and fashion trends. 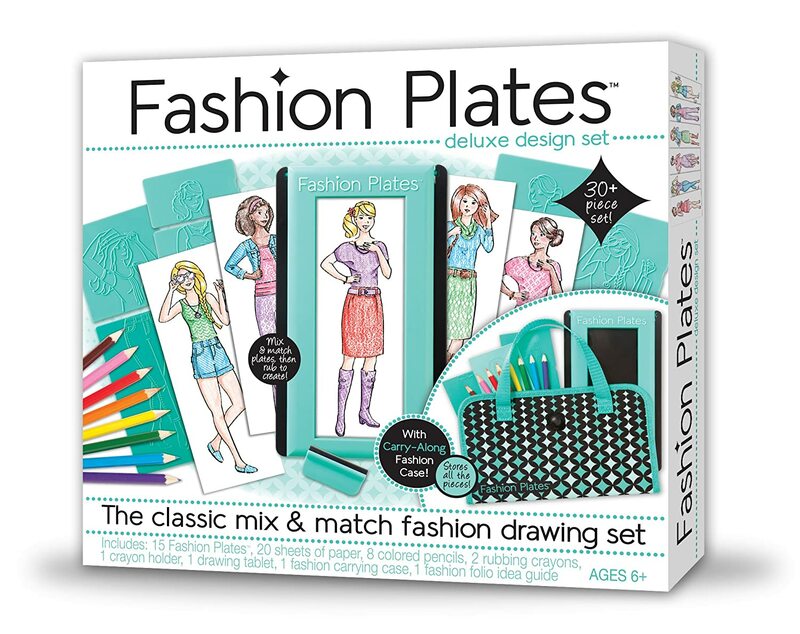 While Bella isn't sure of what she wants to be when she grows up, she is loving being able to hone her drawing and fashion skills thanks in part to the fun Fashion Press by Fashion Plates set we received recently from the folks at Kahootz Toys to review. As a parent I like how this set comes with everything your child needs to easily create endless paper fashion designs. 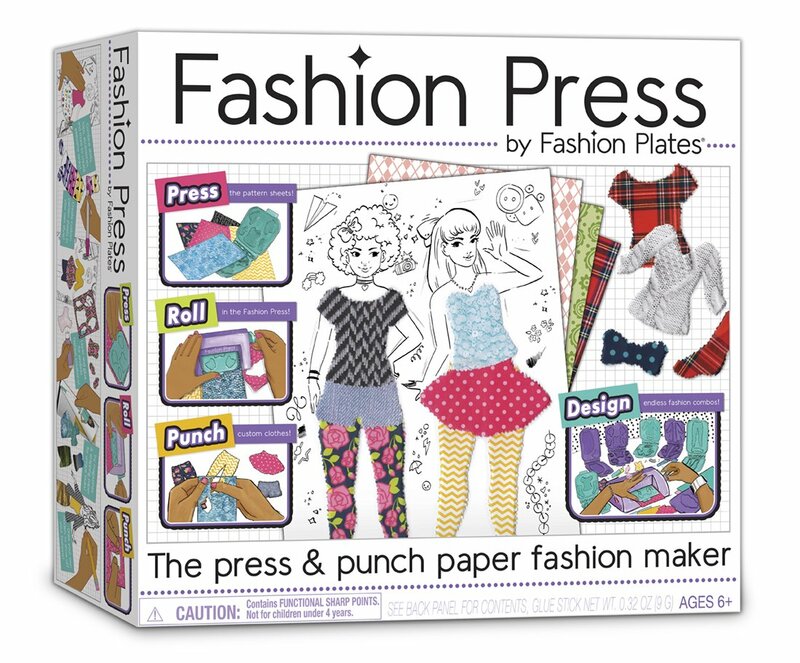 Yes, there are addition expansion packs and even other Fashion Press kits, but if you pick up this particular set they will be good to go in creating fun press and punch paper fashion. Includes eight fashion press punch-plates, one fashion press roller, 50 01355 sheets, 50 pattern paper sheets, and one design guide. The Fashion Press by Fashion Plates kit we were sent includes 50 model sheets -- you can go online and download and print additional model design sheets when you run out, to continue to the fashion designing fun. In addition to the 50 model sheets, you also get 50 pattern sheets, 8 fashion press plates and a fashion press roller. I have to say the best part of the kit is the fashion press roller as this makes it easy to create custom die-cut paper fashions in seconds. This press and punch paper fashion maker is easy to use. You can first look at the idea guide to get some style and fashion ideas, as well as use the different items in this fashion press set. Once you are ready to begin your paper fashion, you choose a pattern sheet and press the pattern sheet into one of the 8 fashion press plates. Then, roll the closed fashion plate through the fashion press. Once through the fashion press, open the fashion press and remove the pattern sheet. You should now be able to punch out the custom clothes you just created. If that wasn't fun enough, the real fun begins when you have all your fashion pieces press and punched out, and you can start pairing together tops and bottoms to the model sheet you choose from the set, or print from online. It only took a few minutes for Bella to set up her new Fashion Press studio on her play table in the living room. She called her big sister over and schooled her on how to use the fashion press roller, and said she would help her create fashionable designs to go with the model sheet Savannah chose. I guess she didn't think Savannah has the style sense like she does. :-) But, at least she was ready to lend a hand. Sisters helping sisters...you can't get any better than that. My girls have been playing with this Fashion Press kit from Fashion Plates for over a week now, and can't get enough of it. In addition to the 50 model sheets included in the kit, I also went ahead and printed some of the others ones you can download and print free online. And, whenever their friends come over to play, they are quick to pull this press and punch paper fashion maker out to show them. And, usually this toy becomes the go-to toy that they girls all want to play with, and then will sit there for hours designing and showing off their own unique fashion senses. If you have a fashionista in your life and are looking for a unique gift to give them this holiday season, why not consider this or other Fashion Press sets from Fashion Plates. Like I said, this set in particular, which I was sent for review, and is available for around $39.00 comes with everything your little fashion designer needs to create endless paper fashion designs. The fashion press roller is easy to use, and makes the whole press and punch paper fashion process a breeze. Both of my girls give this set two thumbs up. They are already asking for the other Fashion Press sets they saw on the Kahootz Toys online store, as well as the expansion kits. I love seeing the girls get creative and being able to create and have fun together, without me being right by their side to help out. And, they are so proud of their unique fashion designs, and love to show them off. So, what are you waiting for? 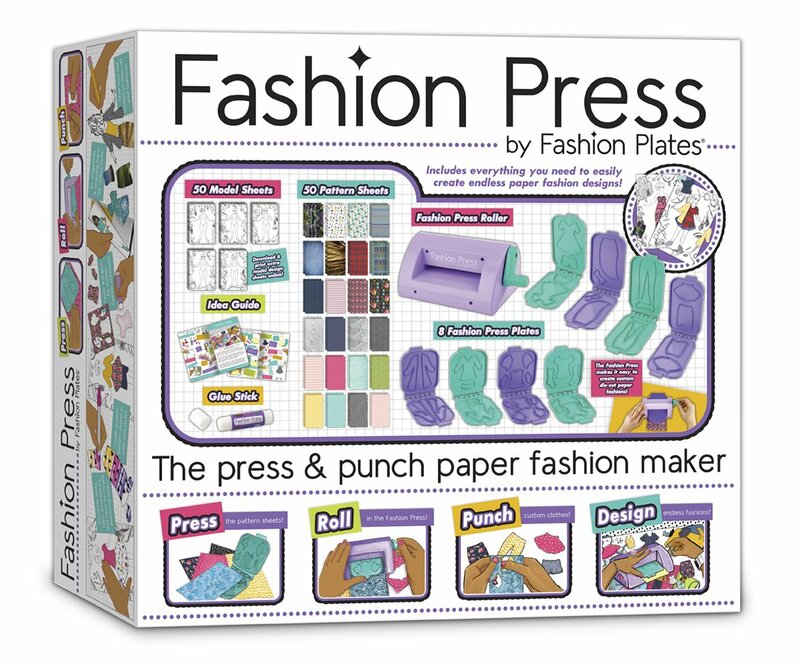 Head on over to the Kahootz Toys website today to learn more about the Fashion Press paper fashion maker sets by Fashion Plates today. I know your kids will have fun making and designing paper fashions with this all-in-one kit. 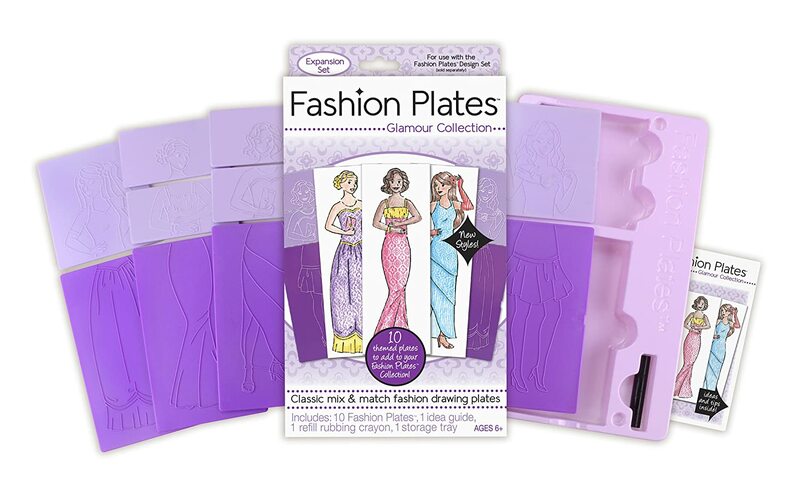 You can find the entire Fashion Press line (including other kits and expansion sets) from Fashion Plates at Kahootz Toys as well as other online retailers like Amazon and in your favorite local retailer including Target.